The Telangana State Medical Common Entrance Test (TS-MCET) for admissions in to 'B' category MBBS and BDS seats in the private medical and dental colleges for the year 2019-17 would be held online on May 20. A notification in this regard would be issued on April 5. A decision to this effect was taken by officials of Telangana State Council of Higher Education (TSCHE), Kaloji Narayana Rao University of Health Sciences and Jawaharlal Nehru Technological University-Hyderabad during a meet at TSCHE on Monday. The online applications can be submitted from April 5 to 27. The candidates can submit their online applications on the website, www.tgmedco.com by paying Rs 2,000 towards the application fee. Hall tickets can be downloaded from May 13. Question paper along with provisional key would be issued on May 21 and objections to the key can be sent till May 24. The candidates would be given merit list with final key and ranking on May 30. The TSCHE has arranged five regional centres including Hyderabad, Warangal, Karimnagar, Khammam and Nizamabad in Telangana and four centres in Andhra Pradesh including Visakhapatnam, Vijayawada, Tirupati. Last year, a total of 6,600 candidates appeared for exam and over 10,000 are expected to take the exam this year. Candidates should have passed or appeared for the final year of the Intermediate Examination (10 + 2 pattern) or equivalent examination with Physics, Chemistry, Biology (Botany and Zoology)/ Biotechnology and English individually and must have obtained 50% marks taken together in Physics, Chemistry, Biology (Botany and Zoology)/ BioTechnology at the qualifying examination. 1. 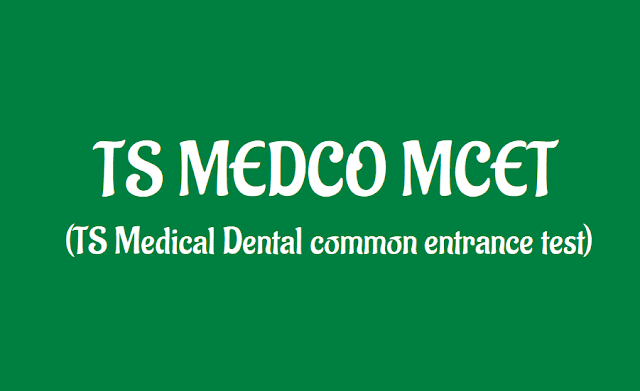 The online application form is available at www.tgmedco.com. 2. The candidates shall fill the online application form. 3. The Registration fee for the MCET-AC-2019 is Rs.1,800/- (Eighteen Hundred only). 4. The fee can be paid by credit card or debit card or by net banking. 5. The candidates are advised to take a printout of the filled in application form after completion of the application form and to note down the application number. So, Application should be submitted through online mode only. 1) Question paper is of MCQ pattern. Candidate has to choose single most appropriate answer from four options provided. 3) Each correct response shall be awarded one mark. 4) There is no negative mark for incorrect response. 5) No mark will be given for the question not answered. 6) Minimum marks required to qualify in the entrance test shall be 50%. As per Medical Council of India/Dental Council of India regulations, the candidates shall secure minimum of 50% marks in the Computer Based (Online) Entrance Test to become eligible for admission into MBBS/BDS courses. 2. The duration of Examination is 3 hrs (180 minutes).